An important message from Rep. Brian Egolf. New Mexico is at a critical crossroads, and I am writing to ask for your urgent help. In this last session, Democrats held only a narrow margin in the State House of Representatives: 36:34. With the upcoming November election, that slim majority is under dire threat. Democrats already lost one seat in redistricting, so we must gain seats in November or there will be a Republican Speaker of the House, and Governor Martinez will have the rubber stamp legislature she wants. We cannot risk losing control to a Tea Party-controlled Republican majority. Because this threat is so serious, I have started a PAC, called the New Mexico Defense Fund. Its mission is to preserve and grow our House Majority and thus stop the divisive political agenda pushed by Republicans around the country today – the war on women, the deep cuts in critical education funding, the elimination of important programs to support a strong middle class, the restriction of minority voting rights and the denial of civil rights to citizens. I cannot sit back and just wait for this to happen in here, so I am asking you to join me in a very important fight. All funds raised will directly support Democratic State House candidates in critical seats this fall. If Republicans pick up even one seat, I will lose Chairmanship of the House Energy & Natural Resources Committee and be replaced by an anti-conservation Republican. I would no longer be able to use my position to stop Governor Martinez’s overt efforts to roll back common sense environmental protections that keep our water and natural resources safe. Other important committees would also be chaired by Republicans, and that means the Governor’s Tea-Party agenda will sail through the legislature. Please stand with me on May 29 at our kick-off fundraiser and be as generous as possible. It will be at the home of Debbie Fleischaker & Kathleen Fontaine from 5:30 - 7:00 (details are in the invitation, attached here). I know that the demands on political donors right now are as high as ever. Nevertheless, raising funds and using them strategically and deliberately to hold onto the State House is critically important to our future. Your invitation to the event is enclosed along with a remittance envelope in case you are unable to attend but would like to contribute. Please note that the envelopes are addressed to my campaign, but if you make you check payable to the New Mexico Defense Fund or make a similar notation for credit card payment on the envelope, your generous contribution will be used directly to support other worthy Democrats in key races. As always, I am grateful for your support and your help with this critical endeavor. P.S. In the span of 15 years, Texas quickly became a Red state after nearly 120 years of solid Democratic control. 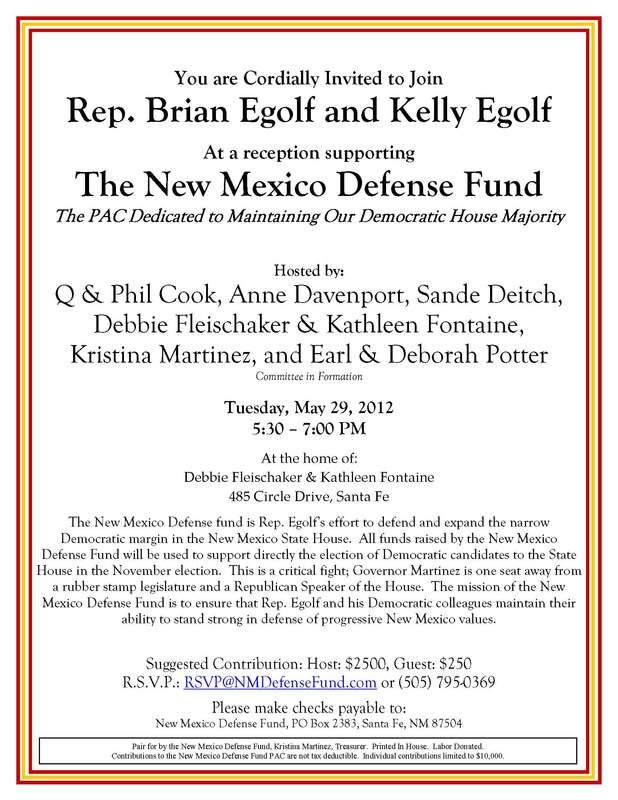 Please don’t think that it couldn’t happen here and make your contribution today to the New Mexico Defense Fund. Representative Egolf Introduces New Homebuyers Energy Savings Tax Credit Bill Short-term Tax Credit Encourages Consumers to Buy New Energy Efficient Homes or Upgrade Foreclosed Homes, Creating New Construction Jobs, Improving the Existing Unsold Home Market and Generating Net State Revenues. Today, Representative Brian Egolf introduced HB 177 the New Homebuyers Energy Savings Tax Credit plan that will create new construction jobs and generate important revenue. The plan, analyzed by the non-partisan research organization Architecture 2030, builds on the success of the federal First Time Homebuyers Tax Credit, as a means of increasing new homes sales and renovations in a distressed housing market. The plan marries a refundable state tax credit with energy reduction targets in order to dramatically increase private spending, stimulate new building construction, expand the local tax base and generate much needed jobs and tax revenue. "I and my colleagues are focused on ideas that will create well-paying jobs and benefit our state's economy as a whole," said Representative Brian Egolf. "The Energy Efficient Home Income Tax Credit will create well-paying construction jobs, help New Mexico's working families save money on their utility bills, and make homes more affordable. The proposal will also bring major benefits to small businesses statewide and help move foreclosed properties off the auction block and into a family's future. This will be a big win for our recovering economy." and a $8,000 State tax credit or rebate for purchasing a zero-net-energy or HERS 0 home. "The New Homebuyer Energy Savings Tax Credit'-like the popular First Time Homebuyer Tax Credit-is focused on encouraging new homes sales which will help revitalize the construction market," said Ed Mazria, CEO of Architecture2030. "This tax credit also helps the existing home market, as it offers the same tax credit for purchasing and upgrading foreclosed properties that are sitting vacant and reducing property values in communities across our state." "Our member businesses support the NM Homebuyers Energy Saving Tax Credit because it will create jobs, will help our construction sector get back on its feet, and will help families move into energy-saving homes," said Allan Oliver, CEO of the NM Green Chamber of Commerce. "This is a fiscally responsible measure, since the state receives the additional revenue prior to paying off the credit and it will sunset automatically in two years." "Our state's homebuilding industry needs all the help it can get. This bill addresses the demand side of the energy efficient home market and could help stimulate new home construction. New Mexico home builders are national leaders in energy efficient home building, but we need customers demanding homes built beyond code minimums." Kim Shanahan, Executive Officer, Santa Fe Area Home Builders Association.